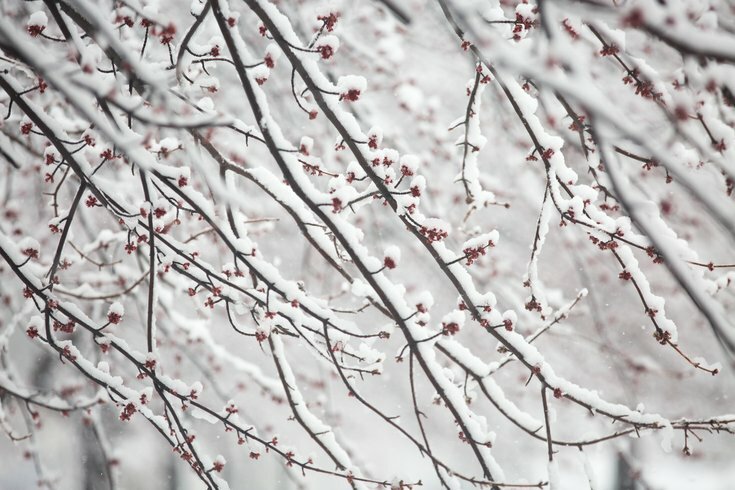 Snow collects on the buds of trees during a snowstorm on March 7, 2018. A South Jersey middle school teacher was struck by lightning during the snowstorm that moved through the region on Wednesday, according to multiple media reports. The teacher – a 33-year-old instructor at Manchester Middle School in Ocean County – was struck by lightning while on bus duty at 2:30 p.m., according to NBC10. RELATED STORY: Nor'easter brings surprise thundersnow to Philly area; did you hear it? The teacher, who has not been identified, was holding an umbrella when the strike happened, according to the Associated Press. The woman reportedly was taken to the Jersey Shore Medical Center with non-life-threatening injuries. The strike happened as people reported thundersnow during the nor'easter, which dumped several inches of snow across southeastern Pennsylvania and South Jersey. Thundersnow – an unusual phenomenon – occurs during quickly spinning nor'easters that generate vertical instability, just like in the summertime, according to The Washington Post. Additionally, a property in Ship Bottom on Long Beach Island in Ocean County reportedly caught fire after being struck by lighting.